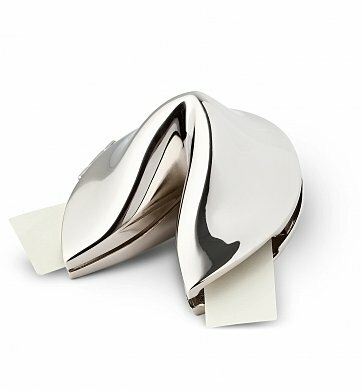 A gleaming silver-plated fortune cookie holds your personal message - it's a creative gift and a memorable keepsake for graduates, birthdays, anniversaries, weddings and more. Silver Plated, tarnish-resistant keepsake fortune cookie. Gift arrives presentation-ready in velvet pouch. A free card with your personal message is included with your gift. Enter your message using the personalization option during checkout. Maximum of one line with up to 100 characters. Metal Fortune Cookie with Personalized Fortune is a hand delivered gift. These gifts are delivered by one of our local design centers located throughout the United States and Canada. Same day delivery is available for most gifts when ordered before the cutoff time. The cutoff time for Metal Fortune Cookie with Personalized Fortune is 2 PM in the recipient's time zone. Complimentary personalized message inside the fortune cookie. Silver plated fortune cookie creates a memorable, enduring keepsake. Gift arrives presentation-ready in velvet drawstring pouch. I purchased the fortune cookie for a dear friend%u2019s birthday. I loved that a message can be personalized. My friend loved her gift. Thank you for creating such a beautiful and original item. Sent this as a retirement gift and the recipient really liked it. Great memorable gift that can be held onto, but does not take up a lot of space. The only thing I would love to see would be the option to engrave the fortune cookie. Thanks for an affordable, unique and memorable gift option! I bought this and I am rather surprised at the quality of the cookie. It's heavy weight and does not look cheaply made. This gift is a great concept. Everyone - whether they admit it or not - likes to open a fortune cookie with the hope that it says something great about their future. This gift allows you to write a very personalized fortune for someone and, after they open it, they have a very attractive reminder of the fortune it predicts for them. I will send it again, for a variety of people and a variety of reasons. I received a message from the friend I sent this to and she said it was by far one of the most creative and unique gifts she has ever received. She absolutely loves it. She sent me photos of it on her desk and I was very happy with the size, and beauty of elegance that comes with this gift. Loved it!!! Both recipients of these absolutely love them and were totally surprised. Most of what I saw were the usual coffee mugs, etc. These were perfect personalizable congratulatory acknowledgements. Fast Shipping & Excellent Product! This item was delivered very quickly and is an excellent product! It came with great presentation and the little personalized card is a great addition to the gift. The fortune cookie is heavier than I thought it would be, and the fortune paper is stronger than I thought it would be. I love how the fortune cookie opens sideways, so it's easy to remove and replace the paper as many times as someone wants to read it! I will definitely be ordering from this company again after ordering this production. Thank you GiftTree! Sent this silver fortune cookie to our son and his girlfriend for a St. Patrick's Day Gift to wish them good fortune and love all year through. They both just loved it and said they would use it throughout the year to leave each other special message from time to time. Thank you for have new and exciting items to choose from and being very well priced. Was worried about it's delivery time, but it did make it there. I will order a little earlier the next time I order something. The main thing is they are happy with it and surprised by the nice little gift, so I'll be back!! Thanks again for being Awesome!! 1st I want to thank Tradd for helping me out. I wanted to hand write on the piece of paper. He went out of his way to ask the manager if they can send the piece of paper with nothing written on it, which they agreed to it. Tradd called me back to let me know that we cannot use pen . (He didn't have too call back, but because he cared, he did. He wanted to make sure I knew the information). 2nd this gift is for my supervisor's retirement from everyone on her team. When she opened it she cried. She said these are the things she collects. SHE LOVED IT SO MUCH AND EVERYONE ON THE TEAM THOUGHT THIS GIFT WAS AN AWSOME GIFT!!!!!!!!!!!!!! This gift was for her 54th birthday. She said it was very nice and thought it was a great idea. Quick, easy, get well gift. Product allowed me to customize my note, which was nice. Got there within a few days and the recipient seemed to like it. I haven't seen it in person yet. I sent the metal fortune cookie with personalized fortune to my hubby for his birthday. It was extremely well-received with delight, as the product is very beautiful, and larger than I expected. He proudly showcased it on his office desk at work! can not wait to give it to my grandson who saves all the fortunes over many many years that he has and we have had. Everything I have ever ordered is wonderful quality. Excellent products and delivery is always on time. Thank for such a wonderful place to shop for every type gift you need. Everything I have ever purchased is absolute quality. I have purchased a few things and the price and quality is superb. I tell everyone that gift Tree covers all occasions and you won't be sorry. Besides quality and price they are always on time. Thank you Gift Tree. I would hope there is a way that free shipping could be given for X amount of items ordered. Thanks again! It was great! I loved it! I was just a little disapointed that it wasn't delivered exactly as it is in the picture but still worth the amount paid. Great finish...Bigger than i imagined, Bottomline- Loved it!!! I purchased ten (10) of these fortune cookies as gifts and had them all personalized according to the individual's personality. The presentation was fantastic ..... there was not one wrong personalization and everyone wanted to know where I purchased them. Needless to say, I felt terrific that the cookies were so well received. Of course, I am planning to purchsae additional cookies of this type for other gifts in the very near future. This is a nice thoughtful gift. Good price and the personalized fortune is priceless. Giving as gift to original wedding party at our 50th Wedding Anniversary Party. Anxious to see how they react to item and message. Most pleasant sales rep. Represented your company very professionally. Beautiful Gift and very pleased!!!!! Thank You!!!! Love it so much I bought a few! A nice keepsake, being able to add a message to the insert makes it a more personal sentiment. I bought this for my partner from the UK and when it arrived he was over the moon! I got a reminder email from a purchase I made last year that spurred me into gear for a gift I almost forgot. I love that service. Thank you so much! This was really cute presentation & the personalized fortune really brought a needed smile! The recipient of the fortune cookie loved it and said she "will cherish it forever." It is on her bedside table as she recovers from surgery. I loved the idea that I could create my own "words of wisdom" on the fortune strip. I gave the fortune cookie to the young lady I have been seeing. She loved it! Beautifully crafted, presentation was a breeze with the nice pouch it comes wrapped in. There is now a special place in her home for the fortune cookie and my message inside. I think this is an awesome gift! Loved the special message! I ordered 3 of these lovely fortune cookies for 3 separate and uniquely different occasions and they were loved by all 3! Great construction and nicely presented! this cookie is beautiful. I wish initials could be engraved on the cookie. What a great idea. I bought one for my boss who is leaving for another job. This was a great suprise gift for someone. He loved it! Purchased for daughter in law as a birthday gift. She was so touched by the unique meaning and personal message. Mother and father in law are in good standing with her! What do you get the person who has everything?.....a fortune cookie with your own personalized message inside! I got this for my Mom's 68th Birthday and she loved it! Especially since my fiance proposed to me with a real fortune cookie with a "will you marry me" fortune inside! Makes for a GORGEOUS keepsake! Recently purchased as a graduation gift and recepient LOVED it! The custom personalized "fortune" I was able to include makes this a most thoughtful unique novel gift! I PURCHASED 2 IN 2 WEEKS! SUCH A GREAT GIFT FOR ANY OCCASSION! Although I haven't seen it, I sent it long-distance as a Birthday Gift for a special gentleman's 84th birthday. I DO know that it brought a tear of joy to his eyes. What more could you ask for? I GAVE IT TO A 14 YEAR OLD TO REMEMBER A SPECIAL DAY AND A ACCOMPLISHMENT IN HER LIFE! GOOD QUALITY AND REASONABLE PRICE. I WILL BE ORDERING IT FOR SO MANY MORE OCCASSIONS. I did not put the personalization in correct spot. The girl that helped me on the phone was great. I also went over allowed characters and she worked with me to get it right and when it came it was perfect. I've sent this to 3 people so far... birthday, get well and new home gifts. The message inside is a winner with everyone I've sent it to. I'm sure I will purchase another one soon. My daughter recently got engaged. The fortune cookies were a perfect way to send them our congratulations and welcome our future son-in law into our family. The size and quality was perfect and they both arrived in pretty black satchels. My friend loved her gift that I sent for her promotion.....much better than flowers that would die after a few days. Just wished they gave more room for the fortune. I did not have room to include who it was from and the card I thought would go along with it was MIA. Its was not until after I spoke with her that she knew it was from me. Otherwise Loved the fortune cookie! This was sent to a dear friend as a gift; I have not seen it yet but she called me when she received it and all she could say was that she was still smiling. My friend who has been sick and feels not too lucky was so moved by this beautiful fortune cookie. The workmanship is awesome. I ordered this for a friend who is moving out of state. The fortune cookie was perfect. I was able to put my sentiment inside. This is an inexpensive gift, that looks like it cost a "fortune"! It was absolutely beautiful, and I liked the fact that the paper where my sentiment was written, was laminated. It came with a velvet bag, and I used a Chinese take out carton as a box. I think this is a gift she will always remember, and one that I will buy again. Ordered this item for my wife as a gift. It shipped fast and quality of the item is great! My wife loves the item and has it displayed on her desk at work. Very nice item and affordable as well. It is a great personal present everyone loves it. An excellent non-disposable alternative to flowers and stuffed animals. I did not see the physical item, but the recipient (male) called me long-distance to thank me and tell me how much it meant to him. I think the sentiment is in the "fortune" you can create yourself, but all I know is that it was the right gift for him. Hope it turns out as well for you. A close friend of mine had relocated to NYC from Perth, WA and I wanted to send her something thoughtful and a bit cute - so I searched on this website and came across this neat little gift! The most fantastic thing about this is that you can personalise the message that goes into the fortune cookie!! She loved it, as did I. Would highly recommned sending it through with a personal and funny fortune. One again, I ordered a gift from GiftTree.com and was more than pleased. The gift was terrific, yet reasonably priced. The recipient loved it. The process was easy and the gift also arrived in a timely manner. I would HIGHLY recommend GiftTree.com! I purchased this fortune cookie for a friends birthday. Because we have Chinese food every week at work I thought she would like it. And she thought it was adorable. I like the fact she can put something inside or just use it as a paper weight. Really cute idea!!! Purchase was for a 16th. Birthday my nephew really liked it plus the "fortune" which you can personalize. I bought the Fortune Cookie for a very dear friend for her birthday. I had it sent directly to her so I have not seen it. But, she absolutely went crazy over it. She loved that it was so unique and that the fortune was written by ME. I, also loved those qualities, especially that it was so unique. I wanted more than flowers but no just another "thing". The Fortune Cookie was perfect. We sent this to one client for one occasion and then used the cookie idea for a wedding gift. We were able to incorporate our client's new last name with a sweet phrase on the paper and that was the most absolute perfect personal touch. We're so pleased with the quality of products that come from GiftTree and we're happy to be life customers. We wanted to thank a vendor of ours for going above and beyond but we had just recently sent flowers for a birthday and we knew the gift would arrive on Valentine's Day. We didn't want to send the wrong impression and at that point, flowers seemed uninteresting. This was absolutely perfect and that fact that we were able to write our own message on the fortune made it more personal. I can't wait to send more of these perfect little treats! Unique and personal gift for those who have everything! The cookie opens on a small hinge to to make a small memento box. The personalize fortune makes this a delightful surprise. This is an awesome gift for any occasion. Gift comes in a velvet bag, so purchase a nice box or bag to present. Previously ordered items from this site not only exceeded expectations but came beautifully packaged. Regardless, I will purchase this item again and highly recommend it.